The Voice Season 11 Top 12 Rankings: Who's Going to Need a Save! The Voice Season 11 Top 12 Rankings: Who’s Going to Need a Save! If you missed those eliminations, you can see the performances and read the commentary from the recap. Otherwise, let’s take a look at The Voice top 12! We all have our favorites, but one aspect of The Voice we often forget is that money and the coveted younger audience counts. That’s not a criticism – just a reality check. The show wants a winner that will be successful. Younger people with disposable income are the ones who support a new artist’s career. When The Voice switched voting to online only, they cut out older people who aren’t as tech savvy, and poorer people who don’t have smart phones or home computer access. The “instant save” (more on that in a bit) is done only through twitter. So, if you don’t tweet, you can’t vote to save your favorite artist. The other thing is of course that actually buying the music on iTunes or streaming an artist’s music on Apple music counts as votes as well – and those are cumulative votes. In other words, if you aren’t online to vote, and don’t pay to download or stream music your opinion doesn’t count. Now we can talk about the difference between favorites and front-runners. You can get a sense of who The Voice season 11 favorite artists are by looking at the YouTube videos of their work. YouTube is free, so it’s a good way to gauge who’s popular. However, a front-runner is based on iTunes and apple streaming. These two platforms don’t always correlate. You can bet that the coaches all know who’s doing what on iTunes. Once you start looking at those stats you can see that those numbers factor into their choices. As I mentioned before, those iTunes and Apple music streaming numbers count as votes – and they are cumulative. That’s where things shift. That’s because not everyone in the top 12 has charted on iTunes. Those votes create a buffer for them in the live voting. At this point, that buffer isn’t necessarily enough to save a singer – but it certainly helps. Here are two quick examples. Josh Halverson charted top 20 on November 1st but still got eliminated the following week. However, Brendan Fletcher has charted top 100 more than once thus far. That certainly had to figure into Adam’s logic in picking Josh over Riley Elmore and Simone Gundy who were more popular. With Josh out of the picture Billy has the highest charting song on iTunes – “Crying” came in at number 28. He also charted on the Canadian charts. Being that he’s also the top favorite, he’s currently heavily in the lead to win this entire thing. Of course, if anyone breaks out with a major chart-topper the game immediately changes. His version of “The Climb” was number 43, and as a country artist, there’s a strong voting block for him. He’s also pretty popular. For We, the song that hit the top 100 is “No More Drama.” It charted at number 70. She’s super popular as well, second only to Billy Gilman. I weighted Brendan at fourth. Brendan charted he charted two different songs”To Love Somebody” came in at 80, and “Soulshine” hit at 75. However, YouTube popularity had me put him after We. He had to be saved by Adam, while We was voted through. His chart debut was “Superstar” at 87. He’s more popular than Brendan, but Brendan did chart twice. These two are going to be close. If Alicia keeps giving him Luther Vandross tunes for him to knock out the park he could chart more. However, r&b usually gets knocked out in the top six. We’ll have to see. Personally, I love Sa’Rayah & Aaron – but they are long shots. Currently Sa’Rayah is at number 5 on the iTunes blues chart with “I’d Rather Go Blind” and the duet she did with Aaron Gibson is at number 19 on that same chart. No one else’s music is on any of the niche charts right now. So, that does give them a spark of hope. Remember, the iTunes vote are cumulative. The reason I have Sa’Rayah and Aaron tied is that blues and r&b usually don’t fare well when you get to the top six and under. Otherwise, I’d have Sa’Rayah ahead of Aaron because she does have more of an iTunes audience than him, and she’s more popular in general. However, down the line a white male rock-alternative singer is likely to do better than a black female r&b singer. That’s how that’s generally played out over the years. Not always – but mostly. Then toss in the Miley Cyrus factor. Miley’s voters are handy with apps and twitter. If it comes down to him being her only shot to be in the top three I suspect they’ll come through for her. These things make the sixth spot too close to call. None of the other performers have charted on iTunes as of yet. You can consider them all in danger! 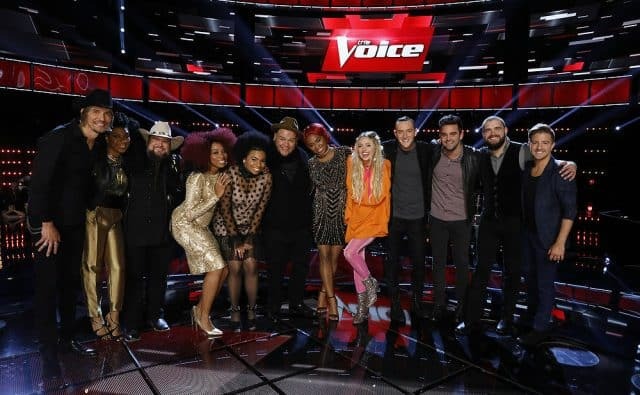 The Wrap Up: Tonight The Voice Season 11 Top 12 Perform! Tonight you’ll have a little breathing room. The voting won’t close until tomorrow. Unlike the live playoffs, you’ll actually be able to watch all the performances before making your choices. Oh, and West Coast viewers, you get to vote too this time! However, on Tuesday we’re back with the instant save. Garth Brooks is gonna be awesome! However, now that you’ve seen the rankings you know that instant save is gonna be important. Because it happens live the West coast is basically shut out. The best they can do is monitor their twitter feeds and tweet/retweet their favorite if that person is up for elimination. In other words, if you’re on the West coast, you might want to invest in buying your favorite’s music to push up their score. Remember, these are not eliminations by team, it’s the lowest scores, period! Team Blake is at risk of losing Courtney and Austin. Adam trickier to call, but Billy is absolutely safe. Brendan is the weak link for the popular vote, but if he charts again he’ll be safe. I can see Team Miley making it through because I think Darby would win an instant save. With team Alicia Sa’Rayah could be at risk. However, Because Garth Brooks will be on, fans of country music will be more likely to tune in. That puts Courtney, Ali, and Sa’Rayah, in jeopardy. However, I think out of the r&b singers really like Ali out of the three, she’s the most likely to make it. Just for the record, yes, some of these are my personal favorites. I’m hoping they make it through! Do you think your favs will? 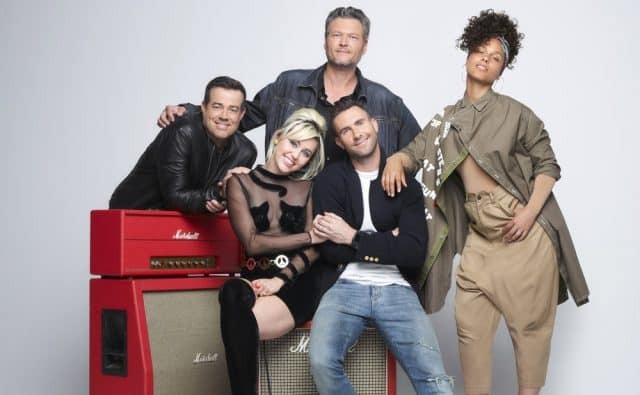 Let me know what you think in the comments and check back for our recap of The Voice season 11 top 12 performances recap! Joy is yet another transplanted New Yorker and has a background in music and cinema studies. She loves writing, music, and watching a good story unfold on television. What’s Even the Point of the New Child’s Play Movie? We’re Proud of Her But Why is Jenna Jameson’s Weight Loss National News?